Featuring 100 veterans and 50 rookies. 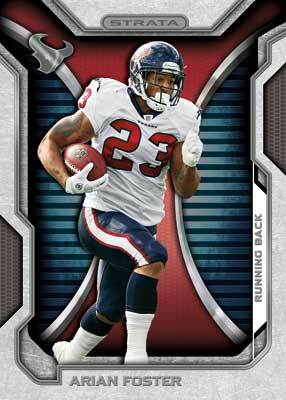 Get full info on the retail and hobby rookie variations. All retail cards are printed on thinner card stock. Rookies also have different photos in retail than hobby. Featuring 43 cards. Inserted 1 per box. 3 patch parallels per case. Click here for a complete visual guide including short print info. At first glance, 2012 Topps Strata Football looks as though it takes directly from the rare Shadow Box insert cards Upper Deck has been producing for several years. However, Topps takes the idea couple steps forward. Above all else, 2012 Topps Strata Football looks distinct from the many other football card sets of the year. The centerpieces of 2012 Topps Strata are the 40-card Clear Cut Autograph Relics and Strata Signature sets. Both are layered cards that combine rookie autographs and over-sized player-worn jersey swatches. Inserted one per box, Clear Cut Autograph Relics have the jersey piece on the bottom. A player photo and signature are done on a piece of clear acetate that is placed on top. A nice touch is that the acetate is die-cut at the top so the jersey or memorabilia piece can still be touched. Clear Cut Autographs have eight numbered parallels, three of which are hobby-exclusive one-of-ones. The most interesting of these have cleat pieces and glove swatches. There is even a sock relic for Robert Griffin III. Additionally, ten Clear Cut Dual Autograph Patch Book Cards (1/1) pair up top rookie players. Strata Signatures take the concept a step further. Numbered to 35 and inserted one per case, they have an added middle layer that has a second player photo. The result is a three-dimensional effect. It is worth noting that Strata Signatures use both on-card and sticker autographs. Strata Signatures Patch parallels are numbered to 15. Rivet Patch parallels (#/5) can be fanned open to show all three layers of the card. The first-year ink doesn't end there. Rookie Autographs have a deep checklist of 50 cards. Inserted one per box, they have six numbered parallels. For the big-time hunt, collectors can look for one of three Quad Autograph Book Cards (1/1). 2012 Topps Strata Football has basic Rookie Relics that fall one per box. Each is numbered, although to different quantities. Hobby packs also have numbered parallels including three patch cards per case. Die-Cut Rookies are the only insert to come without an autograph or memorabilia piece. Inserted one per box, the 35-card checklist makes building a set a challenge. There is also an autographed parallel numbered to 5. 2012 Topps Strata Football isn't all about the hits. There is a 150-card base set lurking inside as well. It's broken down to include 100 veterans and 50 rookie cards. Six parallels have varied numbering. Bronze are the most plentiful with 150 copies while Red cards are one-of-ones. Similar to 2012 Topps Prime Football, hobby and retail base cards have a couple of differences. Cards found in hobby packs use thicker card stock. Also, retail rookie cards use different photos. Go behind the scenes of 2012 Topps Strata Football in an interview with Topps Brand Manager, Kevin Eger. Good: Rookie-heavy product, variety of photos, hobby boxes guarantee three rookie hits, Clear Cut Autograph Relics look amazing. Bad: Base cards have same basic appearance to them with bland backgrounds, some autographs use stickers, rookie parallels are tough to pull, several cards had dinged corners and some fraying issues. 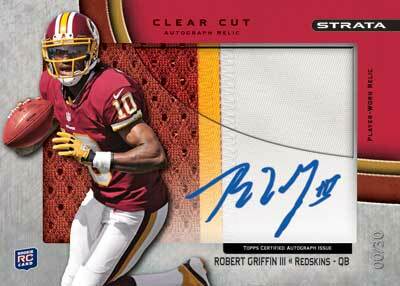 The Bottom Line: 2012 Topps Strata Football is a nice showcase for this year's rookie class. Collectors should be able to complete the base set rather easily and most of the autograph subsets are absolutely beautiful. The packaging issues need to be resolved, as so many of the base cards in our box were damaged. Although the most plentiful players aren't the best, pulling a Gold autograph or a Strata Signature is nice, no matter who it is. The base card design reminds me of the 1990-91 SkyBox Basketball set, with the player's photo on top of computer-generated graphics. The players appear to jump off of the card, similar to a pop-up children's book. The basic autographs are pretty standard, though they come in six parallel levels. The Clear Cut Autograph Relics are very nice, with the autograph directly on the acetate. This set features some interesting memorabilia pieces including spikes, gloves and RG3's socks. The Strata Signature Relic autographs are very similar to the Clear Cut Autograph Relics but they're even more attractive. The additional picture and three-dimensional appearance really pop. I also like the Rookie Die-Cut cards. They are shaped like the NFL shield with crown points on the top and bottom. The Rookie Relic set is pretty standard and are slightly thicker than the base cards. Like the base cards, they are also prone to dings. 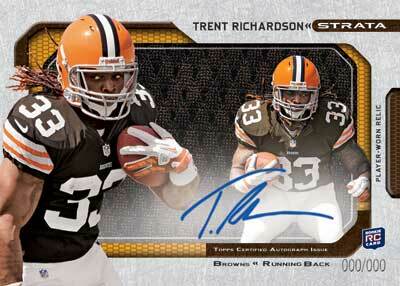 The inaugural release of Topps Strata Football is a rookie-heavy product. I like that there is a decent amount of defensive players, though some are not as strong as others. With only 50 veterans, there isn't much of a need for Peyton Hillis, LeGarrette Blount or Mario Manningham. Different photos are used for rookie cards in the hobby and retail versions, so set collectors may want to collect both. Shortly after release, hobby boxes could be found for less than $90. That isn't a bad value considering the potential for some pretty solid autographs. The problem is that you're gambling that the cards will not be damaged. Overall, the product is rather nice. Still, I would have a hard time spending that type of money for cards that may be ruined. If you're lucky enough to hit on one of the top rookies, you will definitely be pleased. If your hits are commons and many of the cards are damaged, you're going to feel like you've wasted your money as it can be a major hassle to deal with customer service for a bunch of less-desirable cards. Pulling a Strata Signature card was pretty exciting. It's a beautiful set, as are many of the autograph sets. I couldn't help but feel a little bit of a let down once all of the hits were pulled. I felt that all of the base cards were too similar and that I was looking at the same card. I have to credit Topps for trying something different, though. The cards looks gorgeous especially the rookie quad autograph book and RG3 jersey patch auto! Boxes should actually be fairly reasonable – likely around $70 initially. This product isn’t out yet but from the pics ive seen these rookie patch cards look amazing! This could be product of the year in the mid price range level. I always love to see card company try new things or revamp old ideas, can’t wait to bust open ALOT of boxes! my case is pre-ordered and im looking forward to busting this case for my personal collection..the new design topps has come up with is insane…LOVE IT! does anyone know when these cards are coming out???? ive seen three diff daye 4th 5th and 21st does anyone know when they are???? SAM (ID 111118) � Latest date we have is December 21.
i just opened a case of strata and all my cards were chipped or both top edges were white edges, did anyone else have this issue? i feel like i wasted alot of money on this case when all my cards are not mint to begin with, is there a way to contact topps? SAM � Every wrapper has a contact number. If you’re on Twitter you can also try @ToppsSupport. With the holidays, things may be a little slower next week. SAM � You would have to speak with them. I haven’t broken cases, but in the past I’ve had damaged cards exchanged for non-damaged ones. Product looks gorgeous I’ve got one question for everyone though…the rookie relics red parallels are #’d to 30 according to the above checklist, yet i pulled a blackmon #’d to 41 earlier? Kyle Mauerman � Sometimes the checklists we’re given have some anomalies with numbering. Looks like the Blackmon is one such blip as others are out of 30. Thanks for the heads up. I am very disappointed with this product. I also broke a case with lots of damage. Several of my die cuts had damaged points and a lot of base cards had creases on the front only. Explain how that happens!! I was short several hits, 1 Clear Cut auto, 1 Rookie Relic, 2 base autos and 2 rookie parallel. I received 2, yes 2 unnumbered Juron Criner Clear Cuts in my case. Are you seriously kidding me?? Come On, MAN!! Does it sound like I’m upset?? When will Topps learn? While there are aspects of these cards I really truly love, there are so many I hate that it’s hard to get too excited. Hits are nice but my luck has been both good and bad. As in, I’ve got a lot of autographs and patches but nothing that mattered. I was lucky enough to essentially clear a box of all of it’s hits in 5 packs and still couldn’t recoup the money spent on the 5 packs. I absolutely LOATHE the Hobby vs. Retail split. I don’t want a hobby vs. retail set. They might as well not call it the same product if every card is different. What if I collect sets? Now I am stuck choosing between the more expensive, thicker stock hobby or the cheaper lesser stock retail? Hits. Why do they think it’s better to put them on 1000 pt stock cards that look like 50 football cards poorly glued together rather than a little cleaner, little thinner stock? I don’t like the giant stock cards that much and half of the hits in this set are on cards that look like they fill a pack. I hate buying extra top loaders to fit the giganto-mondo sized cards. I hate how they take twice as much space as a regular card in a top loader in the boxes. And finally, now the product is getting more expensive. I bought some and I liked the general layout of the Hobby cards but with the increase in cost, I think I’m out. I’d rather double and triple up on my Topps Chrome than pay the same amount for this product. It’s nice but not THAT nice. (2) boxes from local card shop. both boxes from the same case. (2) coby fleener rookie autos. one bronze and one gold. what’s the deal with topps and collation? all i seem to be pulling out of their football product is coby fleener, a.j. jenkins, or ronnie hillman auto’s. this is becoming nerve wracking. For the money this was my product of the year! The base set is a little boring, but clean. Base auto’s are nice for lower end hits. The CLEAR CUTS ARE THE BOMB, Best Rookie Auto’s so far this year. The higher print numbers are nice, but the lower print patches are beautiful. Low Risk Product Price Tag with a nice upside. Good job Topps!! My dad thought me; “If you can’t say anything nice, don’t say anything”! KC � Topps (and other manufacturers) are good about replacing damaged cards. The best route is to call the number on the wrappers. Very cool set, but I’ve got one card that’s driving me nuts. I got the Case Keenum autograph base rookie #RA-CK. It has no serial number, and no bronze, gold blue or green on the side of the card. The color is white, which makes me think it might be platinum, but again no serial number. Can anyone shed some light on this? Bought a hobby box Feb. 5th that was missing ALL 3 promised hits. Contacted support online and have gotten only 1 response asking me to resubmit the photos. In the meantime I called the support line and was told to stick with my online case. EXTREMELY frustrated with Topps. I usually don’t buy football cards (prefer baseball) and can’t see myself ever buying this product ever again. I submitted a card online months ago and have nothing. it shows that I have redeemed a code and the card it is but has not been sent and no tracking number. NOT HAPPY. 2012 Topps Strata Football Hobby Box (Brand New & Sealed) -2 Autographs Box!